This is the first of a series of articles about how to raise a helper. Use these positive parenting tips to raise an independent and intrinsically motivated child to help with chores and other household duties. I was in the kitchen doing the dishes one day when my 3-year-old daughter came in to grab the stepping stool and take it out the back door. I watched her struggle to open it and wondered what she was up to. I continued to secretly watch her out the kitchen window as she pulled the stepping stool up to the back door, climbed up, and began cleaning. I was in shock for a moment until I realized that this was perfectly normal. This is what happens when you raise an intrinsically motivated helper. My daughter watering the raspberries at 18 months old. The most important thing you can do to raise a helper is to allow your child to watch you work and help. Yup… it’s really that simple! Okay… maybe simple was the wrong word. Modeling how work should be done and assisting your child can be tough. Sometimes it can even be painful. I know it’s much easier to do it yourself when they are young. Please don’t. You will be doing yourself (and your child) a grave disservice in the long run if you don’t allow them to help when they are young. Children are natural imitators. They learn everything by watching us. This is why it is so important to allow them to watch you work from the time they are born. When we tell kids to leave us alone when we are doing a chore we teach them that they aren’t good enough to help. We also teach them that they don’t need to help and that we will do everything for them. Worst of all, we don’t give them the chance to learn by watching us. Is it any wonder when we want them to help they don’t want to? I’d rather suffer through the early years of allowing them to help than to suffer from them not helping at all. I know that allowing them to help is more of a hindrance at first. Trust me when I tell you that those elongated moments of helping them help you don’t last. My daughter helping her grandma paint a wall. My daughter has been around us working since she was a baby. She has been trying to help us with everything since the moment she could walk. No, it hasn’t been all butterflies and rainbows. Sometimes I wish I could just do it myself, but here’s the thing. I want her to feel that she is good enough to help, and I want to encourage her efforts so she will repeat them in the future. Instead of finding something else for her to do (like I’ve wanted to a hundred times), I do my best to ask her to do simple things to help. This means that most things will take longer to do. It also means that your children will make mistakes, but so will we as parents. Mistakes are how we learn to do better the next time. As parents, we not only model how to do home life skills but are an example of how to recover and move on when things don’t go well–even when we get upset. There are pictures of my little one helping us all over this blog. 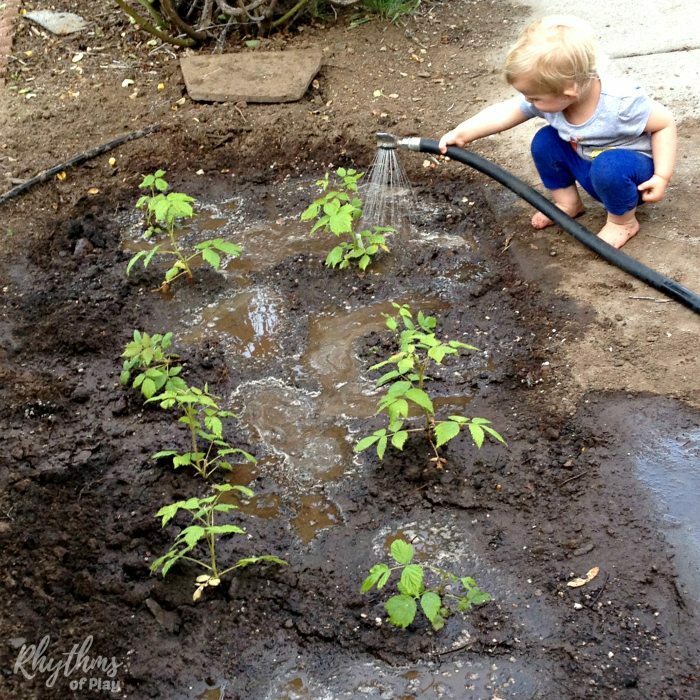 Some of the best, along with more tips for raising a helper, can be found below. This is a photo taken of the moment I decided to put down the dishes, turn off the water, and go grab the camera. I did not stage this photo, ask her to clean the windows or fix her hair. This is real. Young children love to feel useful and want to help around the house. Allowing them to help, even when it makes it harder for us, encourages this aspect of their nature. Pop over to read 15 Ways to Raise a Helper and Tools for Raising Helpers for more tips! This is one of the cutest things I’ve ever seen! That sounds wonderful Teri! It sounds like you are doing a magnificent job of raising a helper! I know you still have to do most of the “work” but soon you will look back and have so much gratitude for yourself, and your little helper, because you took the time to give her the tools to help herself. Isn’t that what it’s all about? Be sure you read the next article in the series “15 Ways to Raise a Helper.” It hits on a lot of what you mention above. And stay tuned… there is more to come! Can’t wait to read the rest of the series! This is something that my husband and I are constantly working on with our 3 year old. We’re really impatient, to be totally honest, so like you said, it’s literally painful sometime letting her help. ha ha Especially with dishes. Gah! I hate doing them to begin with. I’m so glad that you are enjoying it! I know how painful it can be, and sometimes we just have to do it on our own, but helping them learn to help us will pay off in the end. Keep up the good work mama! I love this! My 17 month old always wants to help me unload the dishwasher by bringing me the silverware one by one. Yes it does take much longer than it would if I did it myself but if he starts doing it now it will become second nature to him. Parenting is all about doing the hard work on the front end so you don’t have to have those battles when they get older. omg the pride on her face with the paintbrush how sweet!!!! Priceless! 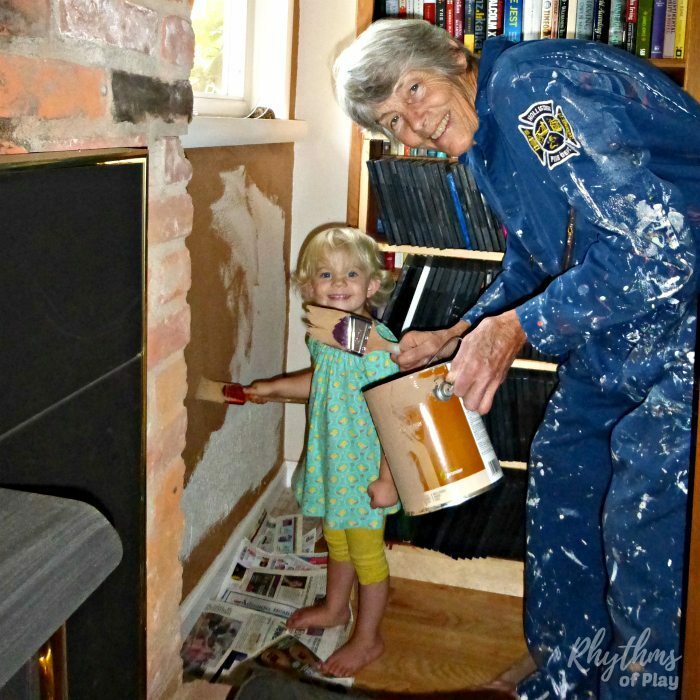 She was so excited to help grandma paint her living room walls that day. One of my favorite pictures!